Sharing our quest for good food. Sometimes a dinner is tasty because of fancy sauces or special cooking techniques, but sometimes a good meal just lets the flavors of quality ingredients shine through. This meal falls into the latter category (also known as an easy meal). We found some beef knockwurst at the farmers market last weekend and thought it would be a perfect mid-week meal. It was delicious served with some Bubbies lacto-fermented sauerkraut and mustard. I am partial to Kosciusko Spicy Brown Mustard. We first found it at a Polish market in the East Village of New York City, but then we came to realize that it is available everywhere. 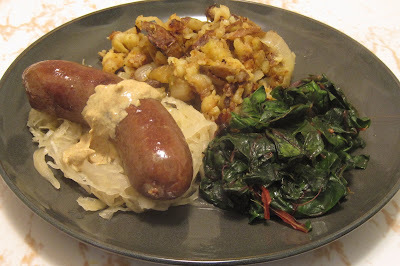 We served our knockwurst with a potato and onion hash and sauteed red chard. Boil the knockwurst for 10 minutes and just cook it in a pan for a few minutes to brown it up. It stayed incredibly moist and juicy. We will always be using this technique in the future. Cook the potatoes and onions separately to help the potatoes to stay crispy. My husband fried up the potatoes and got them nice and crisp, and then added the onions. The onions released so much liquid that the potatoes became mushy. I think cooking them separately would solve this problem (unless you would like them mushy). What's a simple meal that you love to make that let's the ingredients shine through? This post is part of Simple Lives Thursday, Full Plate Thursday, Frugal Food Thursday, Alphabe-Thursday, and URS: Potato Recipes. That does sound delicious...all except the red chard. I think that's what you called it. I have to confess... I've never eaten any cooked greens. I just can't stand it! My tummy is so upset that I continue to view these posts!!!!! A great and tasty choice for a post! That looks like my kind of meal! Gorgeous! Oh, I'm hungry. I think I know what we're having for dinner. Love bubbies!! My favorite easy meal: grilled salmon and my "whatever's fresh in the fridge" salad...lettuce, apples, gorgonzola, cukes, snow peas, avocado...olive oil, balsamic or lemon juice, salt, pepper...but as it's "name" implies, it's never the same twice since it depends on what we've got on hand. Yum, grilled salmon and a "whatever's fresh in fridge" salad is our kind of meal too. That looks awesome! I love sauerkraut. Mostly on bratwurst but that's my Wisconsin showing ;-) I'm certain I'd love it how you served it here. Delish!! Hi there. A tip on the onions and potatoes. I would have cooked the onions first, removed them from the pan, then added the potatoes. Then once those became crispy, added the onions back in. I like sauerkraut and hot dog weiners cooked together with some brown beans and corn bread. That's some good ole country eating there! We once ate at a german restaurant in town and they made something similar to your dish. It was so yummy, too. Unfortunately everytime I have sauerkraut it hurts my tummy. :( Thanks for visiting and have a good weekend! I would just love this meal, I love everything on that plate, do you have leftovers, I'll be right there. Thank you so much for sharing with Full Plate Thursday. Hope you have a great week end and come back soon! This looks exactly like our favorite type of meal! Chard is so delicious and healthy! Blog Carnivals, Hops and Links...Oh My! Raise your hand if you like supplements! 2SearchBlogs Web DirectorySEO friendly business web directory.